Sir Roger Moore has said he believes Daniel Craig is the best actor to have played James Bond. The 84-year-old, who played the British spy in seven films between 1973 and 1985, praised Craig's performances in his new book, Bond on Bond. "I loved Casino Royale and Daniel Craig. He is a wonderful actor, certainly the best actor to play Bond," he said. He added he thought the 44-year-old had "the best build of any Bond". Recalling his years as 007, the veteran actor said: "Back then I could leap out of a chair without fear of my knees cracking. "[I] could chew a toffee without fear of losing a tooth; could admire my flowing locks and my bronzed, slim torso. "With a twitch of the old eyebrow I set pulses racing across the world, they say. These days it's my pacemaker that keeps my pulse racing." 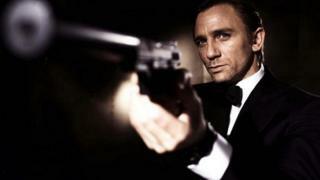 Craig's third Bond film, Skyfall, is due for release in the UK on 26 October. A new trailer for the movie was unveiled last month, showing Bond being "killed" in action and his boss M typing up his obituary. It also gave fans the first glimpse of Bond villain Silva - played by Oscar winner Javier Bardem - in action.